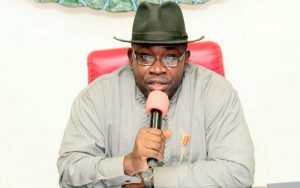 Bayelsa State Governor, Mr. Seriake Dickson, has maintained that the state government cannot pay its workers full salaries because of dwindling revenue. The governor stated this during a meeting with members of the Bayelsa Elders Forum in Yenagoa, a statement from the state’s Ministry of Information and Orientation, indicated on Saturday. Dickson urged the elders to prevail on the civil servants from their different localities to accept the ongoing payment pattern. The government had been paying workers in the state 50 per cent salaries since February 2016. The statement quoted the governor as saying, “In the area of public service, I appeal to the elders to be part of the discussions by engaging civil servants from their localities to accept the ongoing payment pattern as government at this point cannot pay full salaries. Also, Dickson paid glowing tribute to elders and founding fathers of the state who fought and persistently agitated for the creation of Bayelsa in 1996. Noting that the state was not where it should be, he nevertheless said it was not where it used to be. Meanwhile, the state government has said activities of the militant group, Niger Delta Avengers, shrank the state’s revenue. The government said during a monthly transparency briefing in Yenagoa on Friday that the group’s activities had reduced the oil revenue accruable to the state from N3bn in July, 2016 to N1bn in August, 2016. The Deputy Governor of Bayelsa State, Rear Admiral John Jonah (retd. ), declared a deficit of N1.9bn during the briefing. Jonah, who announced a gross inflow of N8.7bn, said N1.4bn was spent on bank loans, N2.1bn on civil servants’ salaries and capital payment of N3.2bn. He said the recurrent payment was N1.4bn, while that of political appointees salaries gulped N472m, bringing the total outflow to N8.9bn.